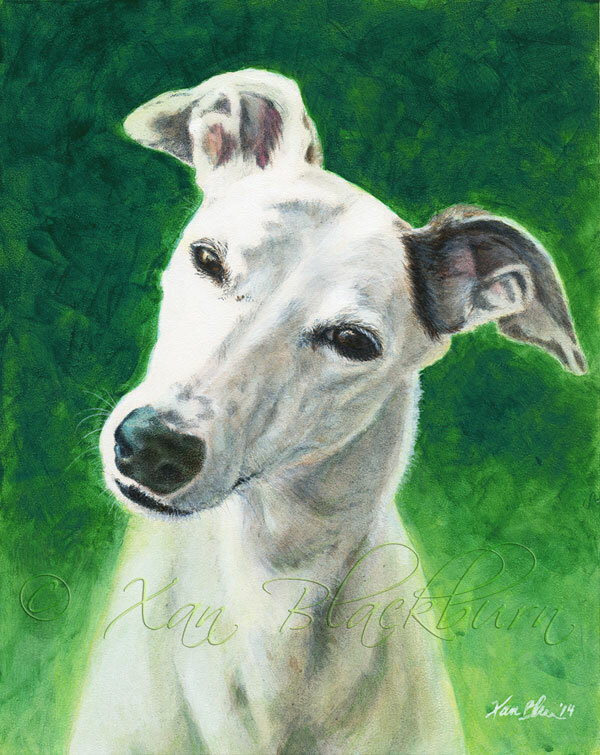 Xan Blackburn: Pet portraits, etc. This winter didn't exactly go as I had planned. I had planned to spend it experimenting with some new ideas and techniques, and some new subjects. That isn't what happened. A group of people I've worked with in the past to rescue dogs in S. Korea pulled together into a more official unit, calling ourselves Team Inch, and we spent the winter saving dogs! I was able to use my art to help out, too, designing a logo, website, facebook pages and fundraisers. Check us out! If you haven't already, check out my new Commercial Art page! I'm officially encouraging you to consider adding a human to your commissioned portrait. You always could, but I really want to encourage this possibility. My fascination with the way humans and animals interact is hungry to express itself in my art. When we look at our pet portraits, we hope to feel some of the love we have for that pet; I'd like to capture that actual bond, to focus on the way you (or your child, or friend, or grandmom ...) IS with that dog or cat or hamster (etc.). So, while you're thinking about your commission, I hope you'll consider the possibility of adding the human presence in the portrait itself. acrylic on Aquabord, 8" x 10"
Both of Katie's humans are also artists, so to say I was a little intimidated is to be exercising understatement. I hope they will be pleased and comforted by the painting for many years to come.